(Nanowerk News) A new method developed at the Institute of Optoelectronics Systems and Microtechnology (ISOM) from the Universidad Politécnica de Madrid (UPM) will enable the fabrication of optical nanosensors capable of sticking on uneven surfaces and biological surfaces like human skin. This result can boost the use of wearable devices to monitor parameters such as temperature, breath and heart pressure. Besides, it is a low cost technology since they use materials like standard polycarbonate compact disks, aluminum films and adhesive tapes that would facilitate its implementation on the market. Researchers from Semiconductor Devices Group of ISOM from UPM have not only designed a manufacturing method of optical nanosensors over a regular adhesive tape but also have shown their potential applications. These flexible nanosensors enable us to measure refractive index variations of the surrounding medium and this can be used to detect chemical substances. Besides, they display iridescent colors that can vary according to the viewing and illumination angle, this property facilitates the detection of position variations and surface topography to where they are stuck at a glance. Nanosensors consist of dimensional nanohole arrays (250 nm) which are drilled into an aluminum layer (100 nm thick). In order to cause sensitivity to the surrounding mediums and iridescence effects, these nanostructures confine and disperse light according to the will of the engineer who designs them. 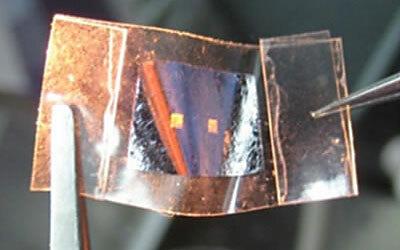 This new technology uses low cost materials such as polycarbonate CDs, aluminum, and regular adhesive tapes. The usage of noble metals to develop these types of sensors is common, but it is difficult mass production due to the high cost. Aluminum is 25,000 times cheaper than gold and has excellent electrical and optical properties. Besides, CD surfaces provide adherence to aluminum that is strong enough to manufacture the sensors over the CDs and weak enough to be transferred to the adhesive tape. This research is led by Dr. Carlos Angulos Barrios, a researcher from ISOM and Professor at the Department of Photonics Technology and Bioengineering (TFB) of the School of Telecommunications Engineering, and also led by Víctor Canalejas Tejero, a PhD student of ISOM. The results were published in the Nanoscale journal ("Compact discs as versatile cost-effective substrates for releasable nanopatterned aluminium films").